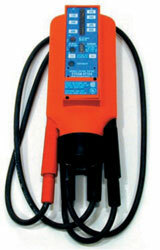 Three voltage indications: Solenoid vibration sensing, electronic neon, visual indication and audible buzzer. 6 to 600 Volts 60/50 Hz. Automatic testing for continuity through 300k ohms. Electronic buzzer indication for AC/DC voltage and continuity. Positive or negative DC pole identified by neon lamp. Retractable and locking, spring-loaded shrouds protecting metal probes. Durable metal probes capable of piercing insulation covered conductors. Self-extinguishing, high impact sealed case and prod assemblies preventing dirt, dust and small objects from entering the tester. Provisions for quick prod storage in case. Case serves as prod holder for one handed operation. Test lead strain relief assembly. VT154LL Heavy duty leather case.